My kids have had these since they were first out and they love them. My eldest is 7 and he still rode on it at the airport when we went this year. They are also very robust. Have lasted many a journey!! Price on mothercare site is £32.99, however they have a price match guarantee where if you can find a product cheaper ANYWHERE then they will match the price and give you a £10 voucher if the product is over £20. As this is £24.95 @ amazon you will get this price plus a £10 voucher. Just call them after ordering. link on post is for trixie. Thanks. I thought it was a good deal too, but not many others did by the looks of it. heat added.....but too much effort for most! Just ordered one of these and it was marked dispatched to store immediately so the customer services adviser said they can't amend anything at the moment and I will have to call back once it's delivered. Apparently they have put a note on the order so I should get the refund and voucher when the order is complete. This is a very good deal, if a little fiddly. However, the last Dell deal had me packing and sending a monitor by courier. This is much easier than that. Great deal, but you can get an even better deal if you price compare with online store TeenyTots using code Trunki20 you can get a further 20% off an already great £24.79 starting price. So Mothercare should price match this and give you a £10 voucher. 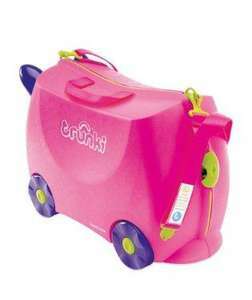 Oh, and you get a fabulous Trunki for under £20!